JPL engineers put together a drone race to find which is faster – a drone operated by a human or one operated by artificial intelligence. The race capped two years of research into drone autonomy funded by Google. 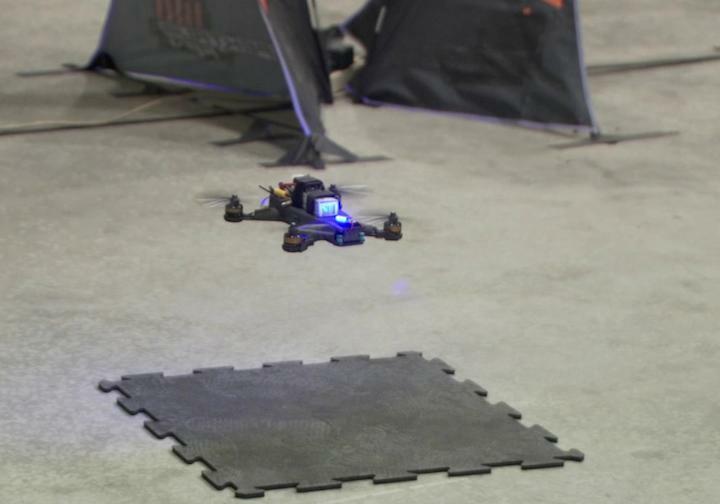 JPL engineers recently finished developing three drones and the artificial intelligence needed for them to navigate an obstacle course by themselves. As a test of these algorithms, they raced the drones against a professional human pilot. Drone racing is a high-speed sport demanding instinctive reflexes -- but humans won't be the only competitors for long. Researchers at NASA's Jet Propulsion Laboratory in Pasadena, California, put their work to the test recently. 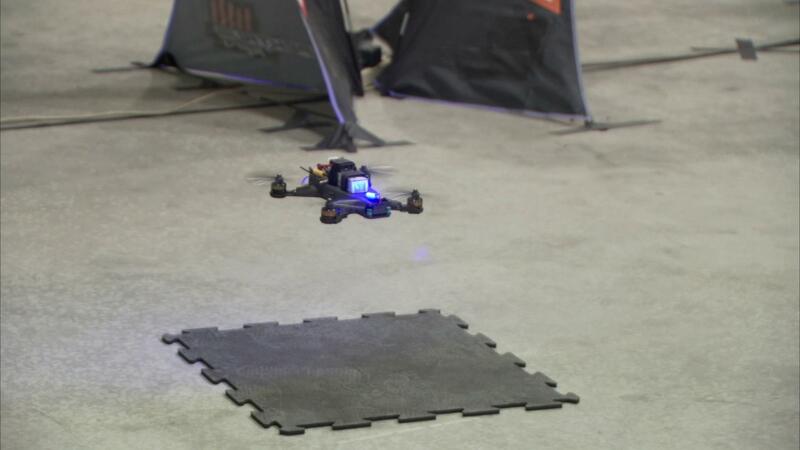 Timing laps through a twisting obstacle course, they raced drones controlled by artificial intelligence (A.I.) against a professional human pilot. The race, held on Oct. 12, capped off two years of research into drone autonomy funded by Google. The company was interested in JPL's work with vision-based navigation for spacecraft -- technologies that can also be applied to drones. To demonstrate the team's progress, JPL set up a timed trial between their A.I. and world-class drone pilot Ken Loo. The team built three custom drones (dubbed Batman, Joker and Nightwing) and developed the complex algorithms the drones needed to fly at high speeds while avoiding obstacles. These algorithms were integrated with Google's Tango technology, which JPL also worked on. The drones were built to racing specifications and could easily go as fast as 80 mph (129 kph) in a straight line. But on the obstacle course set up in a JPL warehouse, they could only fly at 30 or 40 mph (48 to 64 kph) before they needed to apply the brakes. "We pitted our algorithms against a human, who flies a lot more by feel," said Rob Reid of JPL, the project's task manager. "You can actually see that the A.I. flies the drone smoothly around the course, whereas human pilots tend to accelerate aggressively, so their path is jerkier." Compared to Loo, the drones flew more cautiously but consistently. Their algorithms are still a work in progress. For example, the drones sometimes moved so fast that motion blur caused them to lose track of their surroundings. Loo attained higher speeds and was able to perform impressive aerial corkscrews. But he was limited by exhaustion, something the A.I.-piloted drones didn't have to deal with. "This is definitely the densest track I've ever flown," Loo said. "One of my faults as a pilot is I get tired easily. When I get mentally fatigued, I start to get lost, even if I've flown the course 10 times." While the A.I. and human pilot started out with similar lap times, after dozens of laps, Loo learned the course and became more creative and nimble. For the official laps, Loo averaged 11.1 seconds, compared to the autonomous drones, which averaged 13.9 seconds. But the latter was more consistent overall. Where Loo's times varied more, the A.I was able to fly the same racing line every lap. "Our autonomous drones can fly much faster," Reid said. "One day you might see them racing professionally!" Without a human pilot, autonomous drones typically rely on GPS to find their way around. That's not an option for indoor spaces like warehouses or dense urban areas. A similar challenge is faced by autonomous cars. Camera-based localization and mapping technologies have various potential applications, Reid added. These technologies might allow drones to check on inventory in warehouses or assist search and rescue operations at disaster sites. They might even be used eventually to help future robots navigate the corridors of a space station.